The EB2025T is a general purpose bench power supply intended for applications requiring stable and controllable sources of DC voltage at low cost. 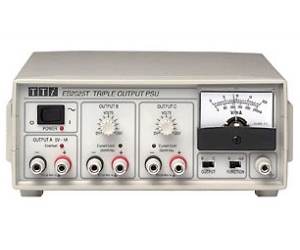 Three independent and fully isolated outputs are provided. Output A is a fixed 5 volt output with a maximum current capability of 1 amp and full short circuit protection. Outputs B and C are independently adjustable from 0.3 volts up to 20 volts with a maximum current capability of 250 milliamps each. The built-in analogue meter can be set to measure voltage or current for either of these outputs. Outputs B and C also offer fully variable control of the current limit point. This can be used to provide over-current protection for delicate circuits. Alternatively the outputs can be used as constant current sources with automatic crossover between constant voltage and constant current operation. The outputs can operate continuously into a short circuit at maximum current setting. Because they are fully isolated, outputs B and C can be externally connected either in series or in parallel to provide voltages up to 40 volts or currents up to 500 milliamps. All three outputs are protected against accidental connection of forward or reverse voltages.